“For years, I’ve been intrigued by the idea of cigar leaf blends, but with one notable exception, nothing has really hit the mark for me, and the one that did, the celebrated Sobranie Virginia #10, has long been out of production. In mid-2000, I began flirting with different ideas, experimenting with different leaf, concocting prototypes, and quickly tiring of them, until, finally, I was shown samples of some exquisite maduro wrapper leaf that stimulated a new interest in finding my perfect cigar leaf blend. After months’ worth of experimental recipes, I zeroed in on the blend I’d been searching for, and Robusto was finally born. 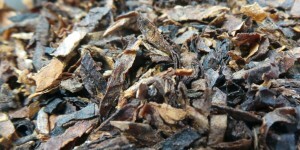 I’ve smoked GL Pease Robusto for several years, and thought “What better way to kick off pipe tobacco reviews on a cigar blog than with a blend containing cigar leaf?” The blend was introduced in November 2002, one of Greg Pease’s Original Mixtures. Blend specifics are not published, of course – but from the information provided we know that in some quantity it contains Virginias, maduro wrapper leaf, Cyprian latakia, and miscellaneous Oriental varietals. It is coarsely cut, but packs rather easily via the Frank method or traditional 3-step packing (which I typically prefer). I have noticed that it seems to need a bit more dense a pack than normal to burn optimally. Robusto is widely available at any number of both Brick & Mortar and online tobacconists, and comes in 2- or 8-ounce tins. Today’s review is based off my experiences with a recent tin I opened bearing a fill date of 6/23/2011 (3 years of age at opening). The first few moments after opening the tin provided a rush of dark, “raisiny” sweetness. It certainly wasn’t overly sweet, but brought forth the delicious aromas of finely aged tobacco – which were likely so at production. The contents seemed just a bit more moist than I usually prefer, so each bowl’s worth has been given a few extra minutes spread across a sheet of paper to acclimate. I’ve never had any serious burn issues with Robusto – nor any Pease blends for that matter – but these few moments of drying seem to make a big difference, especially on the initial light. Without fail, the first few puffs from a bowl of Robusto are very nutty in flavor to my tastes. If blindfolded, I would probably speculate that there is some small portion of burley in the blend, but in all likelihood this comes from the cigar leaf. Body is full, with mouth filling, palate coating smoke. I have to admit that this particular blend is one of very few cigar blends for which I ever reach. I’m generally of the opinion that if you want a cigar, have a cigar. If you want a pipe, have a pipe. I have to credit Mr. Pease with creating a very good blend that can satisfy both desires. At the same time, I don’t believe the average cigar smoker would confuse the flavor with that of a cigar. The cigar qualities are much more pronounced in the room aroma than to the smoker. Generally, I don’t attempt to break down a bowl of pipe tobacco into thirds as some do (and I myself do with a cigar). I will say that mid-bowl really shines for me. Once the ember is firmly in place and my palate has adjusted to the blend, the initial nuttiness slides into the background and is replaced with a woodsy core, tinted with a slightly tannic note. The woodiness is less cedar and more charred oak. I’m a fan of this profile in cigars, and I’m a fan of it in Robusto. This general set of flavors continue throughout until the end – a small patch of mottled ash in the bottom of the bowl. **NOTE: I would not recommend leaving an unfinished bowl for later. Like most cigars, Robusto does not do well with a delayed relight. If you’ve let it go out for more than a few minutes, dump it and refill your bowl. Otherwise, it will likely provide a heavy dose of bitter acridity. This isn’t necessarily a criticism of the blend, but some friendly advice in its care and feeding. A selection of fine, ripe Virginia tobaccos, is enhanced with the perfect measure of maduro cigar leaf to provide an alluring spice, the suggestion of the richness of a great cigar, and a creamy smoke. A little Cyprian Latakia adds roundness and smooths the edges, while fine oriental tobaccos fill in the gaps. Complex and full flavored, yet very gentle on the tongue, Robusto is perfect with afternoon coffee, as a delicious finish to a wonderful meal, or as a stout and stalwart companion throughout the day.